With its long, white breeding plumes, orange-yellow bill, and green facial skin, the Great Egret at the height of the breeding season is stunning to behold. Even at other times of the year, when it loses its plumes and its face and bill return to their typical dull yellow, this large, white wader is difficult to overlook. Male and female Great Egrets are similar (38 inches) at all times of the year. The Great Egret is widely distributed across warmer parts of the globe. In North America, the Great Egret breeds primarily in the southeastern United States, with smaller pockets of breeding territory in the Great Plains, the northeast, and in the west. Most of the Great Egrets in the southeast are permanent residents, but those in cooler climates migrate south for the winter, where they may be found along the coast of California, in the southwest, and in Texas. This species also breeds in Eurasia from southern Europe east to east Asia, wintering in North Africa, India, and Southeast Asia. Populations also exist in South America, Australia and New Zealand. 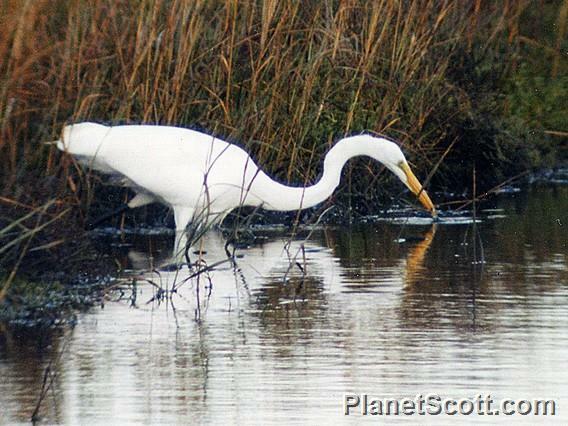 Great Egrets live in and around small bodies of water. In summer, Great Egrets nest in colonies, called ‘rookeries,’ in trees surrounding lakes and ponds. This species utilizes similar habitats during the winter. Great Egrets mainly eat fish, but may also take crustaceans and small vertebrates (such as frogs, lizards, and mice) when the opportunity arises. Great Egrets may be best observed wading in shallow water, where they may be seen plunging their bills into the water to catch fish. It is also possible to see Great Egrets at their rookeries, especially when they return to roost at sunset, or while flying with their feet extended and their necks pulled in. Great Egrets are primarily active during the day. Bibliographic Citation: Rumelt, Reid B. Ardea alba. June-July 2012. Brief natural history summary of Ardea alba. Smithsonian's National Museum of Natural History, Washington, D.C.